On April 3rd, The Robert Wood Johnson Foundation with The University of Wisconsin released the 3rd annual County Health Rankings. Healthcare professionals, academics, and curious citizens are sifting through more than 30 categories of data collected on nearly every county for 2012. At Stratasan, we decided to do our first analysis on obesity. Coming with little surprise, the West has the fewest obese people while the South continues to have the highest levels of obesity in the country. However, this is only part of the story. Just like the new County Health Rankings feature, Roadmaps, the South is traveling in the right direction. Mississippi, Alabama, Arkansas, and Louisiana have the highest concentration of obese counties. 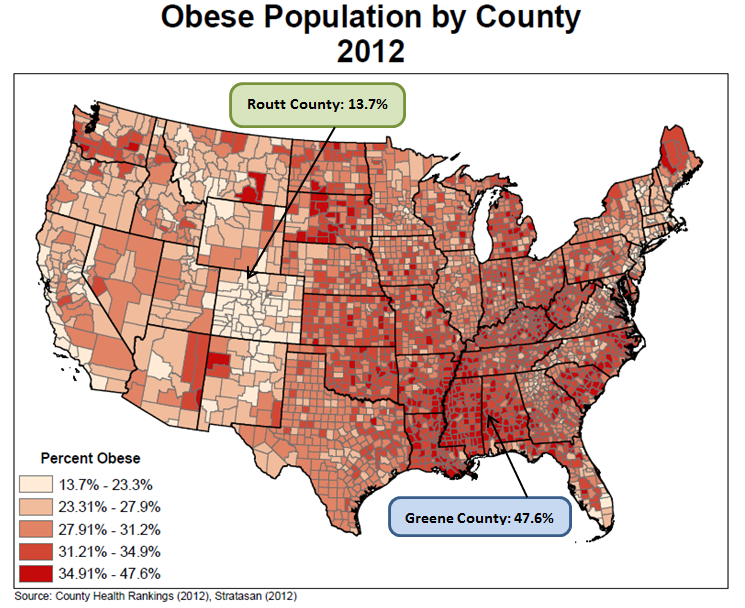 Greene County in central Alabama tops the American scale with 47.6% of its population considered obese. In total, 35.1% of all Alabamians weigh-in as obese. This is a stark contrast to Routt County, Colorado, which has the countries lowest obesity percentage at 13.7%. Although the obesity numbers create a bleak picture, The South is moving in the right direction. 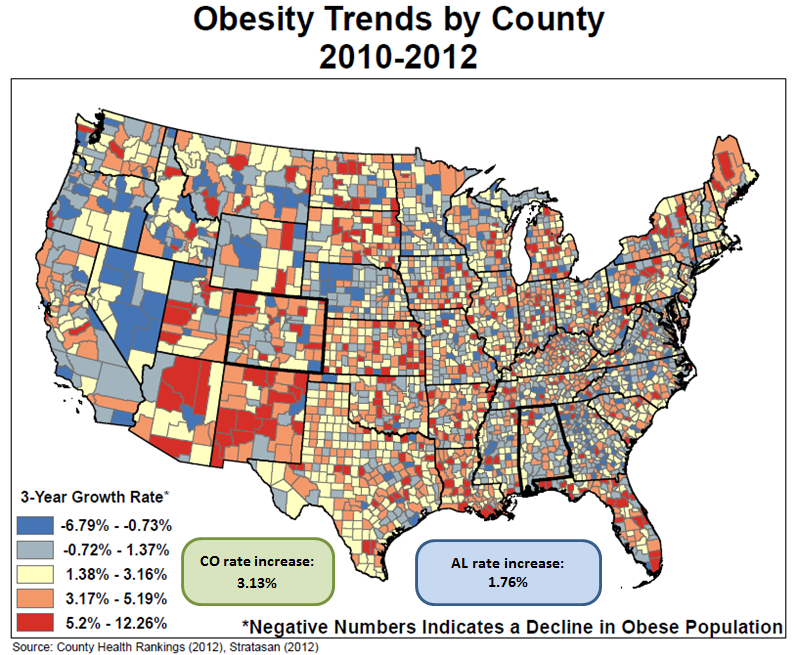 Using three years of compiled county ranking data, we created the obesity trend from 2010 to 2012. In this map, blue indicates the county has an obesity growth rate lower than the national average of 2.35%. Red shows the county’s obesity growth rate is higher than the country’s average rate. While they have not been able to completely reverse the obesity trend, Alabama's 1.76% rate increase over the past three years is well below the national average. Positive shades of blue dominate Alabama. Neighbors Georgia and Mississippi, both with high prevalence of obesity, have also begun to turn things around. Georgia’s 1.31% rate is 7th best in the country and Mississippi’s 1.95% rate is also better than the country’s average obesity growth rate. The South is headed in the right direction. The West has another story to tell. Colorado's rate is 3.13% over the same period from 2010 t0 2012. Likewise, western states Arizona and New Mexico are seeing a faster rise in obesity than both Colorado and the United States. Arizona's obesity growth rate is 3.19% and New Mexico's is 3.98%. All three states are in the bottom 10 for obesity growth rate. While the South seems to be finally turning the tide towards their favor, the West is losing ground faster than ever. Using the County Health Rankings, we can chart the progress made towards better health. Yes, the South has a long way to go to reverse the obesity trend. But, their efforts are beginning to turn the tides in their health story. Obesity is one of many categories narrating how their story of health progresses and where they are headed. Check out www.countyhealthrankings.com to see how your county matches up both against other counties in your state and against the country.